The Aura Elite Travel System is the perfect Travel System for mom and baby. It was designed with input from moms to make it easy to use and with features moms want. The system includes the Aura Stroller and Embrace Infant Car Seat. The Aura Stroller is a durable one hand fold stroller with features mom helped inspire. The stroller features Evenflos patented One Hand Steer for busy moms who have their hands full. Also the parent console features a built in, removable Pampers wipes dispenser to help mom clean up any messes that may come her way. The console also has two cup holders and storage for cell phones, wallets and more. The large storage basket comes with a cargo netting to help hold all mom’s outing needs. There is a five point restraint for baby which may be converted to use as a three point restraint depending on mom’s preference. The seat back reclines for babys comfort and features plush quilted side panels to cradle baby. The canopy has an eclipse feature to help block out the sun from most any angle. The Embrace Infant Car Seat features an easy adjust stay in car base with level indicator, five point harness, infant head insert & body pillow. The seat is designed to fit securely to the Aura Elite Stroller to allow convenience for mom in moving baby from car to stroller. The patented Z-Shaped handle allows absolutely the most comfortable ergonomically correct carry position for moms. The easy access A-Lok adjuster creates quick and easy harness adjustments to insure proper fit for baby. The seat is rated for newborns from 5 lbs. to 22lbs. rear facing and includes EPS energy absorbing foam. (2 for parents 2 for baby) and a place for baby snacks. It also had a deep cubby to store your keys or what not, and a detachable diaper wipe case. The stroller also turns into a baby bassinet which i didnt discover until i put it together. It has 4 brakes (2 front 2 back). The stroller canopy is moveable which makes it nice to block the sun from baby no matter which position baby is laying. the straps on stroller and car seat were easy to move, and it’s a 3 point harness that was easy to latch. The system looks very comfy and it’s easy to navigate. The carseat latches easily into the stroller and detaches just as easy. the stroller is one handed collapse, but you will need 2 hands to load it into your vehicle. The stroller folds up nicely and fits well into my trunk (2 door cobalt). The only thing i really didnt like about the carseat is the short canopy. I haven’t latched the seat in my car yet but All in all i love this set and think my little one will be super happy in it. I can’t wait till he is here!! My husband and i just purchased this sysyem a week ago. 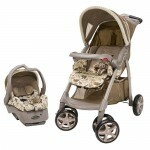 I really love the design and pattern on this travel system, it is nuetral. I put the stroller together by myself, so it was very easy to assemble. I love the fact it has an extra large basket that is easy to access even while the seat was fully reclined. It has 4 cup holders (2 for mom and dad 2 for baby), also has a cubby for baby snacks and a deep cubby for keys or what not for parents. it also has detachable diaper wipe case.The stroller can turn into a bassinet as well, which was a feature i didnt notice until i put it together. The straps were easy to adjust on both stroller and carseat. It has 3 point harness on both. It seems to be pretty comfy. The set snaps easily together and easy to detache, i love the way the stroller folds up to fit in my trunk (i have a cobalt 2 door). I had no problems closing it with one hand release but it will take 2 to load the stroller into your trunk. It has 4 brakes (2 in front 2 in back) which is nice, and a moveable canopy which will block the sun no matter what position baby is laying. The only thing i didnt like about the car seat was the short canopy. all in all i think it is an awesome stroller combo and i can’t wait to put my little one in it!! Love the new pattern of the stroller. We are a couple of days away of the arrival of our second child. The stroller is easy to fold and the carseat is easy to get in and out of the car!!! My oldest son is 5 and loves to get in and out of the stroller. Seems to be holding great!!!! It was good when my son was new born. After about 4mo the back wheels bowed outward. Its so bulky now that he’s older. He seems comfortable enough but I just cant see pushing that big honkin thing around for another year or two. This travel system worked great until my daughter was about 1. When she was too big for the car seat we started using the stroller alone only to find out that she doesn’t fit in that either! She is 50% for height and weight but the straps are way too small. Even on their biggest setting we can’t close them around her. And I don’t like that the back of the seat doesn’t go straight up – it always leans back which makes it hard for her to reach things in the tray. Had this system 16 months and love it! I used it with my newborn and thought the system was great. The seat was easy to get in and out of the stroller and worked so well as a car seat. I used this stroller a lot until my son was 16 months – we are expecting another and need to upgrade to a double stroller. Love that it has a HUGE stortage area (that is easily accesible), 2 parent cup holders, a zipped compartment for keys, cell phone, etc,. It also has a baby wipes tray and a kids tray that rotates out the way (I love this feature because we put finger food on the tray for our son and we also attach toys to the tray and I like that it rotates upward for easy entry in and out of the stroller – now that he is mobile). We have been spoiled with all the mom-friendly features and we are now having a hard time finding those features in a double stroller. Had a great time putting together with my mother who purchased this off of my registry. Easy to put together and was impressed with all of the features. It was more plush than I was expecting. Love that it came with the extra padding for infant in the car seat. Love that the stroller becomes a comfortable carriage for baby to lay in. It opens and folds easily and maneuvers very well. Would’ve liked the car seat and stroller shields to open a bit wider to overlap since it gets very sunny and rainy here. Other than that it’s a wonderful system that provides lots of room for storage and keeps baby comfortable. I’m a new mom, my husband an I was overwhelmed by the large selection of travel systems so I consulted consumer reports and worked from there for the basic features I needed. Carseat: My son was 8lb 2oz at birth and I felt that the infant carseat did not have much head support….his poor little head kept bobbing around. The head insert was of no use I eventually pulled it out and bought another brand head support insert. I just wished the infant car seat could recline a bit more I didn’t think it was comfortable for him to sleep sitting upright since he kept slouching. In addition to which the car seat itself is heavy, baby is now 21/2 mo and 14lbs (exclusively breastfed)and we’ve resorted to taking the stroller around. Pros: carseat: My husband loves the z shaped handle which was very ergonomic, it was generally very cushy the body padding seemed comfy. The hood was just right and i loved the neutral "oh so big color". Best of all it was machine washable and pretty easy to install and set up. Cons Stroller: I felt the wheels were Huge and the stroller after being folded was also quite heavy…sorry but i’m only 5’1"
Pros: Stroller: I LOVE the wipes holder, the one hand steering and the zippered area for my hand sanitizer keys etc This was especially great when I walked the dog. Even my husband was impressed, steering baby in one hand and dog leash in the other 🙂 Although the wheels are huge they were very manuverable and locked for safety front and back. It folded in a cinch, very easy, that made up for the weight. I also love the LARGE storage space below if you’re one like me and like being prepared for a 3 outfit change it’s wonderful. I can also place my cooler of pumped breastmilk below. I forgot to mention my husband also loves the 2 cup holders at the top of the stroller LOL. The feature where baby can recline and the removeable tray were also great. My advice is, do your homework, go to the stores try them out and purchase what fits YOUR lifestyle and needs. Remember nothing is perfect! CAN SOMEONE TELL ME HOW TO GET TO THE BASINET PART. I researched a lot of travel systems before I acutally picked one out. I really like the soft material and pattern. My son feels safe and secure while in the seat. But the stroller as much as I love it. It does not fit in my car at all it doesnt fold up very well and is heavy. The best way to decide and to pick a travel system is to go into the store and push all the strollers your intersted in. I would buy this travel system again. I really like this stroller. It is easy to drive it around , even with one hand. It can be a little bulky, but what stroller isn’t? I use the stroller as a bed sometimes if I have an overnight and can’t bring the play yard. Toys easily snap on the top of the shade so my daughter can play with them. The bottom basket is great too, fits the diaper bag, my purse and some bags from shopping, all without interfering with the part the baby sits in. The stroller is great for walking in the park or jogging track.very manoeuvering when u make turns. a little bulky though but safe. car seat, that comes with it, is just great! I would NEVER buy this item again! The handle on the car seat breaks! We have taken great care of all our items and when we put our daughter in this the carry handle releases on it’s own on one side. We called the manufacturer and they won’t do anything to fix it! Our child could literally fall out when we carry her if she wasn’t strapped in all the way and she does meet all the requirements for height and weight for that isn’t the cause of it breaking. Do not buy this in case yours broke you’ll have to buy another car seat or try to carry it without the handle which defeats the purposed of this type of car seat. New and experienced mother’s beware. This model hasn’t been recalled but should if the handle could break while carrying your child. One of the reasons we loved this stroller and any Evenflo is the design of the handle are the car seat. It’s much easier to hold when it’s parallel to you. Our son loved the carseat and was in it till he hit the weight limit. We now use the stroller all the time. He’s 19 months old and we converted the straps the 3-point which is great. The tray in front is great and the way it opens is helpful when putting a sleeping boy down in it. I’ve taken it to the movies, and he plays, eats and sleeps in it. LOVE IT. To the person who said their handle is broken…its called insurance. Like anything else, it CAN break, so you get insurance so that it is replaced in the store! Duh! Anyway i love this stroller system, the handle shape makes carrying the baby soooo much easier than most. Graco has a lot of systems out there and I wouldn’t buy a Graco if it was all there was! So I’m glad Evenflo topped themselves with this one! We purchased this travel system for my son the week before he was born in February of this year. Since that time, we have used the stroller only a hand full of times and it is already breaking! The plastic that covers the metal pieces that secure the stroller together are cracking and the car seat handle bows with his weight to the point of unsafe! The base of the car seat is big and does not fit into the backseat of my car and we ended up having to take it out and secure the car seat the old fashioned way – with just a seat belt. When it was in the base, when i could finagle it into my back seat, the car seat sat almost straight up and down and made it almost impossible for him to sleep while driving. All in all, I would advise anyone looking to purchase this bundle to do your homework first, especially if you are a first time parent such as myself! This disaster could have been avoided had I researched this bundle beforehand instead of going with what was economical and cute. If you plan on using the car seat in your car, I would suggest going with a Chicco or Graco travel system. I personally hate the car seat that goes with this travel system. I did a lot of research before picking the car seat I chose and this one doesn’t measure up as far as safety goes. If you’re just using this as a stroller, then it’s definitely worth buying for your infant. The stroller has 2 cup holders and a spot for wipes up top, lots of storage underneath, is comfortable for baby, has 2 canopies (1 on stroller, 1 on car seat) to keep the sun from beating down on baby, and it doesn’t look tacky or cheap. Your child will also be facing you, but that’s true with all travel systems. The carseat is easy to install, I love all the pillows for added support of younger babies and that they can be removed as they grow older, it’s really easy for me to carry because of the handle and easy to adjust the length and heighth of the straps, simple to get in and out of the base, I don’t use the stroller that much but when I do it’s very smooth, and I like that I have wipes right at my finger tips, and I love the rubber grips in the cupholders up top so I don’t have to steer with one hand and hold my drink at the same time, I like I can use one hand to steer, the stroller turns on a dime, its great on all surfaces including sand on the beach, and I just simply like the whole thing. I think this is the perfect system and it’s a great price…you get more bang for your buck in my opinion. I greatly recommend to all moms. This product looked better in the store than it was when I started using it. The stroller is much too cumbersome to maneuver in & out of the trunk of my mid-size sedan. It has to be at just the right angle to fit in & out, maneuvering around the rear-seat releases. It simply doesn’t fold flat enough. It appeared that I would be able to recline the car seat, but it does not recline to the recommended 45-degrees for infants, unless the base is installed incorrectly. I would purchase a different brand/model if I had it to do all over again. I picked this stroller out because of it’s cute print and the positioning on the stroller handle. I’m shorter so when I tried several other strollers in the store this one felt the most comfortable to push around. What was a little difficult and posed a problem at first was the closing lock on the stroller. One of the first time I took it out I was stuck on the sidewalk for 30 minutes trying to collapse the stroller. I got so frustrated I almost left it on the sidewalk. Finally I got it closed realizing I had to squeeze the lock down super hard before it collapsed. After using it for sometime now it is much easier to close. The only other thing that I don’t like about it is the canopy on the car seat it is a bit short. And what’s worse is the canopy on the stroller, it doesn’t attach to the stroller and it won’t stretch out fully so it makes the shade small to non existent. I didn’t see anyone else comment on this so not sure if it’s just mine, but the canopy part on the stroller bunches up and won’t stay open so the shade doesn’t always cover my baby’s face. Any suggestions? The infant seat handle is very loose. It feels as though it will unlatch while holding it. The canopy on the stroller does not stay open, and the stroller still rolls while wheels are locked. Has good options but the important features are LOW quality. I like the look of the carseat/stroller and the handle on the carrier is much easier. The base is easy to install and move from car to car when necessary. I only compliant about the carrier is that the sun shade isn’t long enough to cover baby’s face. The stroller is great on different surfaces and the parent tray is really handy. Having wet ones in the dispenser makes unexpected clean-ups a breeze. The worst thing about this stroller is folding it up. Once I got the hang of folding it up, it was less frustrated but it folds away from you making it hard to hold on so it winds up laying on the ground. It’s big and bulky to get in and out of the trunk. Also, the sun shad isn’t long enough and often won’t stay extended but bunches up. It doesn’t have a window in it, so you can’t see baby when it’s open. My baby love this travel system, she is very comfortable in her car seat and can sleep soundly on it. The stroller is heavy and bulky are the cons I can say, as long as my baby is comfortable and happy with her travel system I’m okay with it. This was a gift from my baby shower. the only problem I had with my carseat with was the shade on it was not long enough. The stroller is big and took up half my trunk space but it was a smooth ride.I love the color of it.Having somewhere to put my drink and wet wipes is very nice. I use this travel system a few times a week about an hour at a time. I take my daughter and dog for a walk at the same time, and it works great! It has 2 cup holders which I use often, one for a drink and the other for keys and cell phone. It has a holder for wipes and a secret little compartment right underneath that for plastic bags or money. It also has a nice size under compartment to put multiple things, like a diaper bag, purse, etc. We bought this product after much diliberation. We spent several weeks going to the store and trying out travel systems and reading reviews before deciding on one. I love pretty much everything about this travel system. The car seat is cofortable for my son. In fact, when we brought him home from the hospital, this car seat was the only place he would sleep besides my arms. The car seat feel safe and secure and the stroller is sturdy (although it is a bit heavy for me to lift when I am out with my son by myself). There is plenty of storage for shopping bags, diaper bag and toys in the stroller and having the base in the car so you only need to remove the actual car seat is a huge plus. Additionally, my mom also bought a base for her van so when she watches him she can just snap the seat into the car and go. Overall, I definitely recommend this product! Let me start by saying that this travel system is amazing! *the car seat lining is easy to remove and wash.
*the car seat itself is easy to carry with the shape of the handle and is very sturdy, with the safe lock on the back to lock it into place on the stroller as well as shopping carts at the grocery stores. *the stroller has easy glide wheels that never stick, I have been using this product for 4 months now. Overall the product is great. The only thing that I don’t like is that the cover goes but so far and not enough shade for my baby. This stroller and car seat are great! I have not had one single problem with them! Cute and lots of comments as well, I would reccomend them to Everyone I know! Worth the price!! very cute and neutral. cushions are very soft and supportive. Durable and nicely made. Have to move front seat forward in my car for it to fit in and I wish the car seat reclined more…but overall it is good for the price.